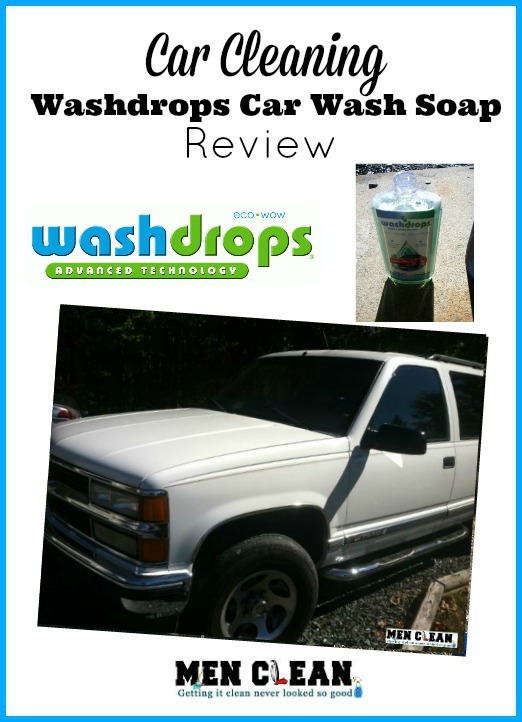 Cleaning my Chevy Tahoe with WashDrops Car Wash Soap! 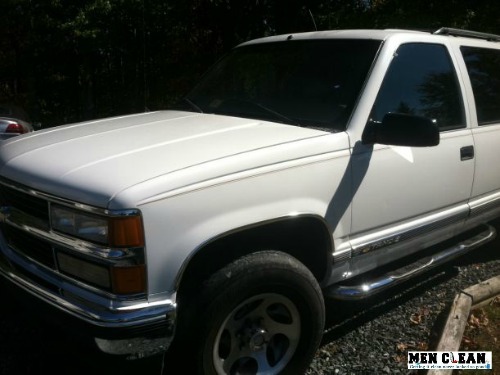 In order to get your attention – Instead of giving you the “before” shot, I will start with the after shot – my truck freshly cleaned with Washdrops. LOOKS PRETTY GOOD FOR a 1998! 1. Combine the 3 capfuls of Washdrops with your bucket and water – About the only time you will see “suds” is during this step. The biggest fallacy for me in this whole experience was that you need suds to get your truck clean. That is just not the case with Washdrops. There is some sort of chemical reaction that the cleaning solution has with dirt, brake dust and grime that makes it perfect for cleaning. The best part is not having to pull the tangled up hose from the garage and waste water on the driveway! 3. 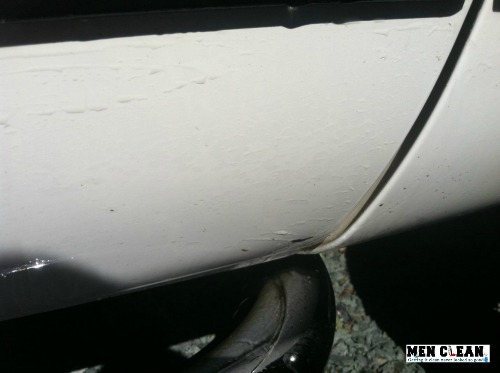 Using a microfiber cloth – dry the dirty water off the car. 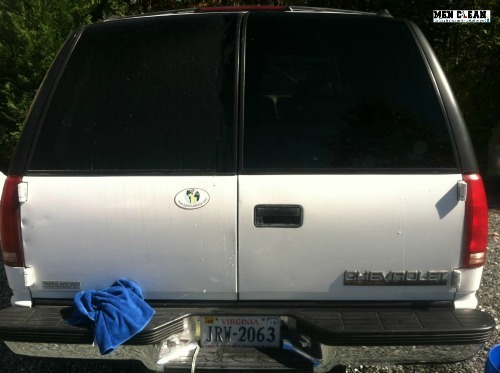 As soon as you finish a section, put the sponge down, grab your drying cloth and dry up the water off the car/truck. You must do this step before the water dries as you do not want the dirty water to leave a residue. 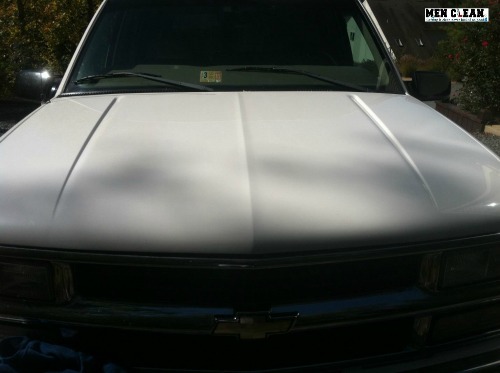 In the below pic the right side has been cleaned – you can see the shine! 4. 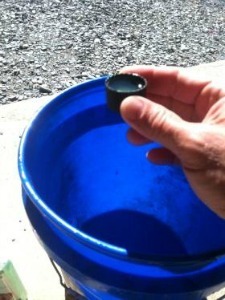 Do the Wheels last – One other area I was skeptical was with using Washdrops on my wheels/rims. I used a wheel brush, and just like the on the paint, the brake dust came right off with a little rubbing. Here, I would recommend using a separate cloth to dry as this will turn dark black from the brake dust. For some reason, I felt very awkward at the beginning of this wash in that there was no hose and no suds to enlighten my car cleaning experience. But in the end, the result was flawless – in fact I saved time and money (no water needed to rinse). 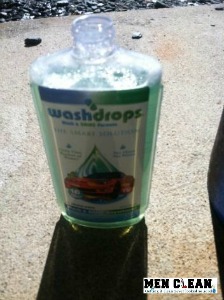 From one bottle of Washdrops, I will be able to wash my truck at least 7 or 8 times – which is amazing value for the price of the product. I also did not need sap and tar remover like I normally use for those tough to clean areas like the undercarriage areas behind the tires. The only downside to Washdrops is that you need to switch between cleaning and drying – intermittently. Do not try and clean the whole car then dry or you will find dried residue that is unlikely to come off unless you re-clean. Overall I give the product a B+!!!! Check out Washdrops now! To get the latest updates Like Washdrops on Facebook and Follow @Washdrops on Twitter. Do you have Car Cleaning Tips? Share it with us below.